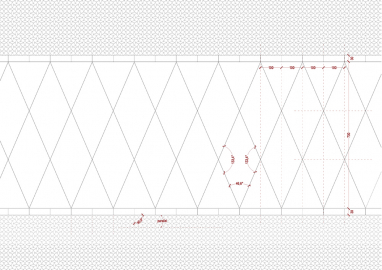 The New Slovenska Street project is based on cutting-edge concepts in public space design. 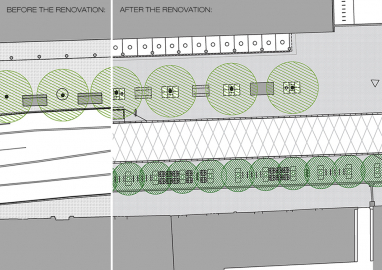 Despite the large volume of pedestrian and bus traffic it is designed as a “shared space”, a space, where users participate equally, and height differences are reduced to a minimum. The former four-lane road was thus transformed into the central city avenue. A car-oriented traffic road is thus transformed into a space which gives priority to public transport, pedestrians and cyclists. 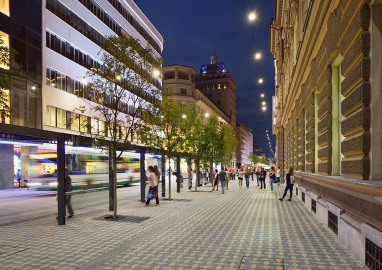 By designing a space which promotes sustainable mobility and public transport in the very centre, the city has made a key step in it's transport policy, and completed one of the key projects in the European Green Capital 2016 project. 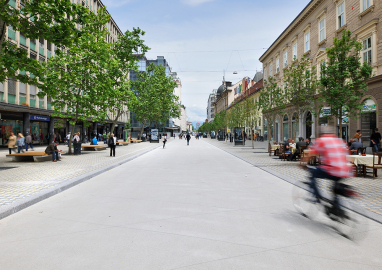 The new Slovenska street is a manifest of the future of the city of Ljubljana. 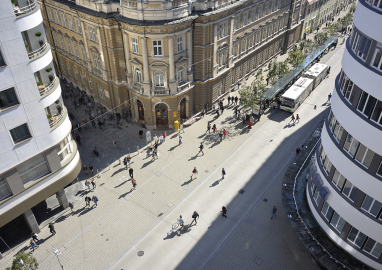 It is a visual transformation of the central city of the capital; but more important than the visual aspect is the functional aspect, in which public transport, pedestrians and cyclists are given a key advantage in moving through the city. The street is, as it has always been, a place of becoming – a place where the city shows what kind of future it strives for. In this case, it is a future, where public transport, pedestrians and cyclists are given priority over the automobile, and where they coexist in harmony. The main street of Ljubljana city is the Slovenska Street (the Slovenian street), which crosses the city in the north-south direction. The street was always a place of urban progress: here the first skyscraper was constructed, the first modernistic housing block... It is also the stage for many important events in the city, such as the marathon or political protests. In a way, it is a space where the city demonstrates towards what kind of future it strives. The transformation drew inspiration from typical avenues in large european cities, where avenues are always marked with two key elements – a vertical and a horizontal one. 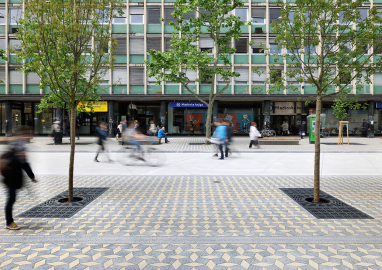 In this case these are the tree-line of manna ash trees (fraxinus ornus), and the geometric pattern of the pavement, which creates the impression of a fine carpet and increases the optical dimension of urban space. 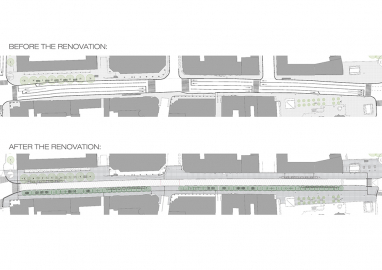 Through narrowing of the roadway there is now more space for pedestrians, cyclists and restaurant and bar gardens. A new tree line of manna ash trees was planted on the eastern side of the street, which is lit by the afternoon sun. 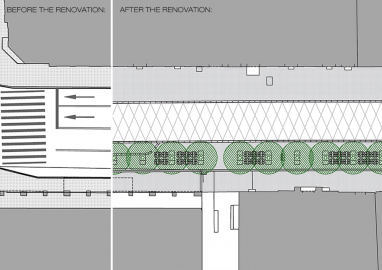 The manna ash trees will adorn the space with white flowers in the spring and bright yellow foliage in the fall. 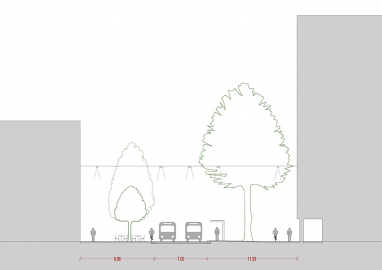 The street is divided in to tree sections, with a concrete road surface and paved pedestrian area. The cruicual element in the design of the avenue is the pavement. 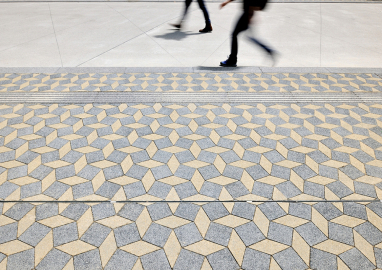 The combination of paving stones in two shapes and colors creates a geometric pattern, which functions as an ornamental carpet and increases the optical dimensions of the urban space.